New EB t-s are dumping in. Shattered Dot t-s are only $9.99 in tons of colors! Massholes unite! 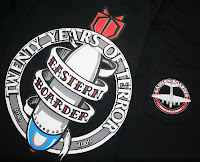 20 Years Of Terror long sleeves, pocket t-s and more. East Ts are coming soon. In a gazillion color combos. EB would like to THANK YOU ALL for 20 years of support!